We’ve been taking liberties with the alphabet again but I’m pleased to say we finally got around to our ‘R’ date. R is for Relaxation – something we both deserved after the not-so-great start to the year. We booked a lovely overnight stay spa break at Eastwell Manor near Ashford in Kent for our 5th wedding anniversary. Eastwell Manor is a charming country house set in the Garden of England and was built between 1540 and 1550. In its impressive history of over 450 years it has had many owners, including Royalty! These days it is best known as a hotel offering spa breaks, afternoon teas and weddings. We checked in to the Robert Curtoys room in the early afternoon – easily the largest hotel room I have ever stayed in! Complete with kingsize bed, chaise longue and Champneys flip flops, robes and toiletries. We headed straight down to the Champneys spa where we enjoyed the facilities and also had a facial each which we had pre-booked. The spa itself features a heated indoor pool surrounded by relaxation beds. There’s also a hydrotherapy pool, steam room, sauna and, my favourite, a jacuzzi. Our package also included dinner plus breakfast and lunch the following day, so after we were all fresh and clean after our spa session, we got dressed up and made our way to the Manor Restaurant where we enjoyed a three course meal. For starters I had the rainbow carrot terrine while Nick had the cheese souffle. For mains we both opted for the Eastwell brisket burger which was yummy, if not a little salty. Lastly, dessert. Nick enjoyed the white chocolate and passion fruit ganache bomb sorbet while I had the pistachio, orange and cranberry which included the most delicious ice cream (orange and cranberry mix? I’m not sure) as well as spiced oranges and olive oil cake. It was sooo good! After a super comfortable and relaxing nights sleep in our humongous bed, we enjoyed a buffet breakfast followed by a stroll through the perfectly manicured grounds. It was lovely to soak up the atmosphere while pretending you are on a television set. We then returned to the spa for body radiance treatments which involved putting on an embarrassingly tiny pair of knickers (for me anyway, my husband got off lightly). Luckily it was all very professional and organised so my embarrassment was very shortlived. The spa therapist exfoliated my skin and then left me to shower. Once I was dry and my modesty protected with towels, she then massaged my skin using some gorgeous scented Champneys moisturiser. We also stopped in the Spa Restaurant for a light lunch prior to our treatments. We could have had several fancy looking courses there too but we didn’t want to be too full before our body treatments so Nick had chicken to start followed by some sensible pasta while I opted for a starter of salmon and then skipped straight to dessert – ice cream… and imagine my delight when I realised one of the flavours was the same as what I had for dessert the night before. Oh yes. You can put the girl in a classy setting but you can’t stop her from ordering ice cream for lunch! Ha! All in all it was a perfect and romantic stay and one I would definitely like to repeat. For more Alphabet Dating Adventures check out my series. No Japan bucket list would be complete without a stay in a ryokan, so here is my guide to a Japanese ryokan experience. A ryokan is a traditional Japanese inn. You may have seen them on tv or in books, they’re the ones with paper screens, low tables and futons instead of beds. How do I choose which ryokan? Ryokan aren’t cheap and the ones that are cheap are most probably not that authentic. We started by looking on Tripadvisor at some of the best ryokan in Kyoto but found many were fully booked for the time of year we were looking at (April – Cherry Blossom season). One of the most famous and historic ryokans is the Hiiragiya which was slightly out of our budget, so in the end we opted for Hiiragiya Bekkan (annex) an authentic but more wallet-friendly option. Other things to note when choosing your ryokan, is whether it includes a private bathroom or any meals, as of course this will affect the price. Our room at the Hiiragiya Bekkan included a private toilet and sink but shared bathing facilities (more on that later) and it also included a kaiseki meal (Japanese haute cuisine) in the evening and breakfast the following day. When we arrived at Hiiragiya Bekkan we were greeted by friendly and enthusiastic staff and as is custom in Japan, we were asked to remove our shoes at the door and wear the slippers provided. We were shown to our room which overlooked a pretty Japanese garden and then we had to remove our slippers. I can’t quite remember how many different pairs of slippers we had, but if you’ve been to Japan you’ll know how much they love their slippers! We were shortly served three different types of tea – matcha, sakura and Japanese. The Japanese tea was nice but the matcha and sakura are a bit of an acquired taste. After tea we changed into the yukata (cotton robes) provided and spent some time relaxing and soaking up our surroundings! Upon arrival at the ryokan we chose a time we would like to have dinner and promptly at this time we received a knock on the door from our maid (for lack of a better word) bringing us the first course of our meal. Some ryokan have communal dining areas, but the other thing that attracted us to the Hiiragiya Bekkan was being able to dine in the privacy of our own room. 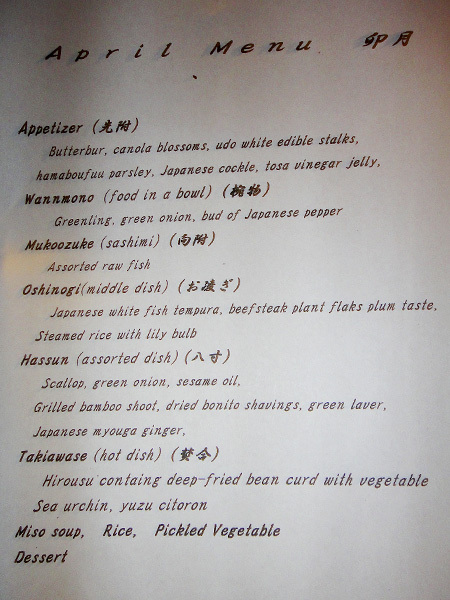 Dinner at the ryokan was a seasonal menu and brought to us course by course. I didn’t really know what much of it was so I took a photo of the menu. It started off ok and I enjoyed the first few courses but I’m so glad we had this meal as part of a ryokan experience rather than at a kaiseki restaurant as I really struggled with a few of the courses. Sadly the bamboo shoots and the deep-fried bean curd with sea urchin weren’t to my taste. In Japan, bathtime is a bit of a ritual. So after dinner we were ushered off to the communal bathrooms. Similarly to pre-booking a dinner time slot, we also had a bathroom time slot too. A friendly old man had prepared our steaming hot bath for us and then gave us our privacy and left us to it. Basically in Japan, bathing etiquette dictates that you perch on a little stool and then soap and rinse yourself with a handheld shower before getting into the tub. The tubs are then for soaking once you are squeaky clean. Our tub was wooden and square, which was different but we had already had previous experience with onsen (hot springs) bathing which I will write about another time. After our hot, relaxing baths we toddled off back to our room where our maid (who may or may not have been a ninja) had switched our room around from a dining room with low table to a bedroom with futons! The futons themselves were fairly comfortable, however the Japanese pillows, which I believe are filled with buckwheat, weren’t the most comfortable pillows I’ve ever slept on, but they certainly weren’t the worst! The morning routine was almost like a reverse of the night before. We awoke early and went for our shower/bath and while we were soaking ourselves, our room was being whipped up from a bedroom back into a dining room, ready for breakfast. Breakfast included an assortment of Japanese nibbles, the fish was delicious, however I struggled to stomach the rest of it. As I’m not much of a breakfast person anyway (yeah yeah I know it’s the most important meal of the day!) and by this point in our trip I just fancied something quite boring like toast. I know. I am a terrible travel blogger for saying that. We checked out fairly early as we were due to travel on the Shinkansen back to Tokyo and upon check out we were presented with a gift – a neat box with chopsticks inside! Very sweet and thoughtful! Advance booking is recommended as the ryokans are quite small and have limited availability. In order to not have to worry about lugging our big suitcases with us for our one night stay in the ryokan we used a luggage forwarding service, quite a common thing to do in Japan and something that can be arranged at your hotel. We used this service a couple of times during our trip, so we had our luggage sent from our Kyoto hotel (where we stayed before our ryokan visit) to the hotel we would be staying at after departing the ryokan. Very efficient and helpful! Follow ryokan etiquette regarding the removal of shoes, showering before bathing etc. And be sure not to place anything in the sacred alcove (pictured below with the wall hanging and flower arrangement). If you enjoyed this then you might like 10 foods to try in Japan or some of my other Japan adventures! Quirky hostel in Australia – Alice’s Secret… shh! One of my favourite places I stayed on my backpacking trip Down Under was a quirky hostel in Australia called Alice’s Secret Travellers Inn. Run by a friendly man named Seb, Alice’s Secret is a small, quiet and relaxed hostel – just a 10 minute stroll to the town centre. The hostel has a mixture of dorm rooms, basic rooms for those travelling in pairs or groups and then two unique rooms – The Alpine Hut and The Betty Boop Bus. Of course we stayed in the quirky rooms! We stayed at the hostel for 4 nights in total – one night in the Alpine Hut and 3 nights in the Betty Boop Bus. The Betty Bus was my favourite – a renovated American style bus with Betty Boop bedding, air conditioning, a small fridge, funky LED lights and the scrawls of previous guests all over the ceiling and walls. The seats and steering wheel were still in there too! The Alpine Hut was more of a shed themed like a Swiss ski chalet. It was fun and had a cute little terrace area but I was glad we spent most of our nights in the bus. This quirky hostel in Australia has shared bathrooms, a kitchen, laundry facilities, a reading den, a tv lounge, bike hire, bbq area, wi-fi and best of all, a swimming pool – perfect for cooling off in the hot Alice Springs sunshine. We didn’t use all of the facilities but I sure enjoyed a dip in the pool and lazing in the garden hammocks! The charming things about this hostel are its relaxed atmosphere and that the other travellers were so friendly, the two cats that live here, the short walk into town and the funny little decorative touches dotted about the place. I was also a little surprised and unnerved about the spider they had in a tank in the reception! If you’re looking for a place to party, then go elsewhere. The only drunk here is the octopus that wants to fight! Everything looks more dramatic in black and white! Ok ok so I made it sound more dramatic and badass than it was, I didn’t get arrested or anything, I just happened to spend the night in a former prison. The Jailhouse, situated in the suburb of Addington in Christchurch, served as a prison from 1874 to 1999 and has been a backpacker hostel since 2006. The hostel is clean, warm and friendly yet still retains its eerie prison atmosphere with elements such as the large staircase which is just like you would see in the movies. Also the rooms are all former prison cells – absolutely tiny and claustrophobic. This is not a bad thing as you would be disappointed if they had gone in there and knocked a few walls down while renovating and taken away its quirky appeal. We stayed in room 21, the coolest thing about it was that right next door in room 20, was the “show room” so to speak. This room has been left untouched and is preserved to how it was after the last prisoner left. You can see the inmate’s art all over the walls, although it is protected by glass, giving it a bit of a museum feel. There’s also another cell at the back of the building which has been left in its jailhouse state and really gave me the creeps. I loved the little touches around the hostel, such as the glass cabinet and the cell downstairs with artifacts from the jail’s history in them, as well as the costumes and mugshot back drop in the reception area for guests to muck about and take a few ‘guilty’ selfies with. As far as facilities go, there is limited free wifi (which only works outside of the cells), a decent sized kitchen, hot showers and off-street parking. As well as a tv room and laundry, amongst other things (although we didn’t use these). And in terms of location, well it was a little bit of a walk into the centre of Christchurch (around half an hour) but only around a 15 minute drive to the airport. All in all I would recommend The Jailhouse as a good base to stay in Christchurch, even for just the novelty factor alone. Plus it gives you a great story to tell your friends when you get home! If you liked this, then why not check out my quirky travel board on Pinterest. Or you can follow me on Bloglovin.